Last April a new strain of HPAI H5N6 appeared in poultry, killing one person in Nanchong City (see Sichuan China: 1st Known Human Infection With H5N6 Avian Flu). Once the threat was identified, local poultry was culled, and we heard nothing more for several months. While Low Pathogenic H5N6 had been identified previously in wild birds in Taiwan, Germany, Sweden and the United States this new strain was classified as highly pathogenic. And like the H5N8 virus which emerged last January and ravaged South Korea’s poultry industry throughout the spring, this new virus was a reassortant of the H5N1 avian flu virus (see Whole-Genome Sequence Of Reassortant H5N6 Avian Virus). 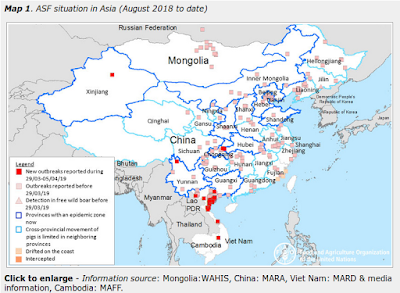 All was quiet on the H5N6 front until early August, when the virus showed up in widely separated outbreaks in central and northern Vietnam (see OIE: Two Outbreaks Of H5N6 In Vietnamese Poultry). In short order we began to see additional outbreaks in Vietnam (see Vietnam Gears Up To Detect, Fight Avian H5N6) and two thousand miles away in northern China (see China: H5N6 Outbreak In Heilongjiang Poultry). Last week, the central Vietnamese Quang Ngai province reported their fourth outbreak in just over a month, and over the weekend Vietnamese media have reported that a massive cull is underway (see A/H5N6 flu virus: Quang Nam culls 800,000 ducks). While its threat to humans is uncertain, the threat to the poultry industry – and to the the food security and meager incomes of households that raise subsistence poultry – could be dire. After a decade of losses due to H5N1, and the recent introduction of the stealthy H7N9 virus, the last thing anyone wanted to see in that part of the world is another avian flu threat. As if that weren’t enough, South Korea’s H5N8 virus – which briefly made it to Japan last spring – could also make further inroads across Asia this fall and winter. Today the FAO released the following news article on their website. Excerpts follow, and I’ll have a bit more when you return. 22 September 2014, Rome - A recently-emerged strain of avian influenza virus in poultry in Southeast Asia known as A(H5N6) represents a new threat to animal health and livelihoods and must be closely monitored, FAO said today. "Influenza viruses are constantly mixing and recombining to form new threats," said FAO's Chief Veterinary Officer, Juan Lubroth. "However, H5N6 is particularly worrisome, since it has been detected in several places so far from one another, and because it is so highly pathogenic, meaning infected poultry quickly become sick and, within 72 hours, death rates are very high." The fact that the virus is highly virulent in chickens and geese and potentially spread across a large part of Southeast Asia translates into a real threat to poultry-related livelihoods. Poultry contributes to the incomes of hundreds of millions of people throughout the subregion. The World Organisation for Animal Health (OIE), which works together with FAO and the World Health Organization (WHO) to support countries' responses to animal and human disease threats, is also monitoring the situation closely. "An effective surveillance and an early detection of animal disease at source are two main keys to reduce the risk of dissemination and to ensure safe trade. The OIE calls on its 180 member countries to respect their commitment and to immediately notify on WAHIS any outbreak detected on their territory," said OIE Director-General Bernard Vallat. "Current evidence suggests H5N6 poses a limited threat to human health at this stage," said WHO epidemiologist Elizabeth Mumford. "It's been detected in multiple places in poultry, yet we only have one human infection reported. This suggests that the virus does not easily jump from animals to humans. Of course, we still need to remain vigilant, because prevalence in poultry and therefore human exposure could increase during the winter." FAO and WHO are stressing that at this time it is critical for countries in Southeast and East Asia -- especially those with links to poultry production and trade -- to ramp up efforts to detect and report influenza viruses in poultry and monitor for any human infections. Although Southeast Asia has long been known as the `cradle of influenza’ - an area of the world where both human and animal influenza viruses circulate in close proximity more-or-less year round and can occasionally serve up hybrids – the past couple of years has seen a remarkable number of reassortants appear. H7N9, H5N6, H5N8, H10N8, H6N1 . . . . all with a increasing number of clades, as well. Of these, H7N9 has provoked the most concern by far, as it has sparked two sizable human waves of infection, and is expected to return when temperatures cool this fall and winter. But H10N8 is no slouch, having killed three people in China last winter, while the others are too new to really evaluate their public health impact. The good news is that reassortant viruses with genuine pandemic potential only appear very rarely. The bad news is that nature’s laboratory is open 24/7, and it is constantly trying to produce the next `successful’ virus. And the more subtypes it has to play with, the greater the odds are it will come up with something we really don’t want to have to deal with. All of which highlights the need for continual and enhanced surveillance of humans, livestock, and wild birds for emerging viral threats. Because it isn’t a question of if another pandemic will emerge. It’s really just a matter of when.